To clarify, the 68 oz.in Stepper Motor uses the NEMA 17 mounting holes. 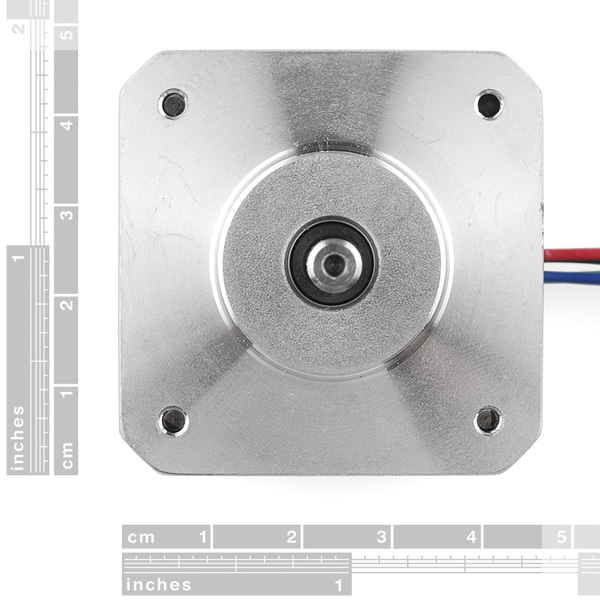 The motor size of this stepper motor is slightly smaller than what you would expect for a NEMA 17 motor size width and length. Try looking at the datasheet for more information about this motor's dimensions. Rated voltage shows 3V but when plugged onto DF Robot Dual Stepper Motor Driver Shield for Arduino the motor will not start with a input tension below 12V. So are they 3V or 12V ??? There isn't any chance of an actobotics mount for any of these in the near future, is there? I was just thrilled a couple of days ago when I noticed the Actobotics parts show up on Sparkfun. I've been planning a project for months, but I've already bought a servocity gearmotor and the Actobotics mount for it, and it won't work for my application. I really think a stepper would be best. I'm going to try to laser-cut something out of acrylic, but it wouldn't be as good as an aluminum part. I was also excited about the actobotics product line but then i couldn't seem to find any stepper motor mounts. Did you ever find a mount of motor that works with actobotics? Actobotics now has NEMA mounts for these. I mounted two of these servos to Actobotics components. I made an acrylic adapter for one (saw and drill press, no laser cutter) that I mounted to a channel piece and just elongated the mounting holes on a dual flat bracket to mount the other. Both techniques worked well. The former is the more elegant solution. The latter is considerably easier. Spacers are required between the motor or adapter and the Actobotics piece. The biggest challenge is getting everything aligned. I use a 1/4-20 screw plate as a drilling template for making Actobotics compatible components. It is steel, not aluminum so it holds up well. And once you drill two holes, you can physically screw it in to your piece to hold alignment. Does anyone know how much this motor weighs? 362 grams on my kitchen scale. I don't know if i should be posting this here or on the Big Easy Driver Page, but i'm hoping somebody will be able to provide me with some insight. I have been able to get it running using the example provided on Brian's website. The issue i am having, is that the motor will only run smoothly when the current is being limited much lower than what the motor is capable of. When i adjust the current limit higher the motor will keep losing power entirely (i.e. the shaft can be freely spun until it starts spinning again). Is this an issue with the supply i am running it off of? The power supply i am using is a 19V supply rated at 4.7 amps. Ok, so you need to read the specfications. NO your easy driver cannot correctly provide enough current for this motor. (Just because it says 2Amps for the new version, that assumes proper thermal managment, AKA cooling). The reason it seems to turn on and off is you are overheating the easy driver. This motor must be limited to 1.7 Amps from your voltage source by the stepper driver. If you start out with 12 volts or higher, the 1.8 Ohms of the motor coil is going to result in more than 1.7 Amps. But that's why we use switching stepper driver that PWMs the output of the H-bridge and limits the current. The thing to keep in mind too is that it's an inductor and thus that 1.8 Ohms is not the complete picture. When the motor moves, we turn off and on the coils and that frequency too affects the complex impedance of the coil. Thus the the apparent voltage across the coil changes to result in the same current as the motor speeds up or down. This is why we want the higher source voltage, to ensure we have enough headroom to attempt to keep the same current (and thus magnetic strength which creates the torque). Again, the key here is that the stepper drive actively limits the current via PWM to the motor coil. That means the driver will kick off a fair amount of heat as the energy must go somewhere and the 1.8 Ohms of the motor isn't going to disipate much. When you turn down the current potentiometer of the stepper driver to a level where it can survive (most say about 1 Amp or less on an easydriver) then you will get about half the rated torque at best. You really need an industrial rated driver (2 Amps or more and heatsinked) to properly run these motors at spec. Again, to be clear, while you might slap a heasink onto the easy driver and add a fan, it may not be enough to properly run this motor at 1.7 Amps in all conditions. You can turn the current down, but then you do not get the rated torque. so 24V at 1.7A should be no problem? I have some of these in my reprap, they are great little steppers. Plenty of torque and .9 deg steps make these great for cnc applications. I'm using the Pololu A4988 stepper driver and while they were a pain to tune, once they are tuned they operate very well. any clues on how to tune these on a reprap? did you just follow the step/unit formulas descriped on the reprap wiki? We've been using these motors on our Mendelmax for a little while. We found a decent set of values that gets reasonablyt fast and accurate printing, and posted the modified Marlin firmware at https://bitbucket.org/terawattindustries/erikzalm-marlin-mendelmax-sfwantai/overview. Look for the configuration.h file. SparkFun, isn't it time to leave the dark ages behind, and move to the 21st century? :-) FTW, in civilized countries 68 oz.in = 48 N.cm. I have a "Big Easy Driver" and one of this "Step motor", the Rated Voltage of the step motor is 3V and the Driver Power is between 8 to 30V, so i can't make it work together???? thank for the answer. With a proper filament drive gear, this motor would be perfect for a direct drive extruder for a 3D printer. I'm using one for a direct-drive 1.75mm extruder. It works great with a little cooling at 1.4A@19.5V off of a Smoothieboard. Retracts are consistent with no skipping or stalling at 4mm @ 50mm/s. Because of the smaller step angle than typical 3D printer steppers, it's not a good choice for geared extruders. This would also be a great motor for axis drive on a delta or XY gantry printer. So I am currently looking at buying two of theses along with two of these http://www.pololu.com/product/1182 but I am confused at how to power these. I was thinking of using my laptops power supply and breaking it out with two female plugs but I have a couple of concerns. First being will I damage anything. Also The computer power supply is 7.7 amps at 17.7 volts I understand the voltage is fine But I am concerned at the current I know the point of driver is to limet current but I just want to make sure it won't burn it out? Has anyone attempted to use this motor with the Seeedstudio Motor Shield V.2.0. I connected this motor and get a lot of chattering and very little turning of the motor. I am not sure if this is a sign of being under powered. I want to use a 4S LiPo battery that puts out 2200mah at 14.8 volts and has a automatic low voltage shutoff that I designed to kick in at 12.3 volts. I am not sure if the Seeedstudio motor shield can drive this motor. I am an ancient experimentor. But this is the first time playing with stepper motors. When I started experimenting, my high sholl instructor consider transitors a passing fancy that would never replace tubes. Any constructive help would be appreciated. Someone bought over 100 of these at a clip because the inventory was well over 100 an now it's 0.
stock for resellers should be different from stocks for general public. resellers should probably not be allowed to buy directly online, otherwise they compete with 'normal' people, and this is unfair. For those curious as to how our stock works our resellers do buy directly online. Having some "set aside" for resellers seems to us even more unfair to our customers. But we also tend to work with our distributors directly to ensure we can get them what they need without causing problems for the rest of our customers. We also recently added a link on product pages of where to go if you need large quantities. I ENAble the board, set direction, pulse using direct bit manipulation to get it as fast as possible, then unENAble the board. I tuned the current to the motor and all seems to be pretty happy. The BED docs say pulses should be 10 Âµsecs. If I do that, the motor stutters. I assume because there just isn't enough time between edges. 50 Âµsecs is the sweet spot I've found. Upwards of 100 Âµsecs or longer and the motor stutters again. When the motor stutters, I try upping the current thinking maybe it needs some help holding between pulses. That just makes the motor and the BED super hot (chip gets to 150ÂºF, motor is barely comfortable to hold) and generally doesn't help the motor move well at all. At 50 Âµsecs, the chip temperature drops to 80-ishÂºF. Anyone have a solid reason why 50 Âµsecs would be the sweet spot for making everything move smoothly? Just curious! You'd want to use the BigEasy Driver. The EasyDriver can't provide enough current per phase for this motor. Where may I purchase gear wheels and pulleys for the NEMA 17 form factor stepper motor? Strangely, I am having a difficult time locating them on the Net. Thank you. I am building my own board for really simple operation. I have TI 8835 H-bridge chip with 3.3V supply. It can only drive 1.5 A per phase. Will it be able to drive this motor? Thanks! My motor is able to turn cleanly one direction (counter clockwise), but the other direction is not very consistent. Sometimes the motor shakes violently and it doesn't rotate as far as it is supposed to. I have wired the motor to the driver in several different configurations, but none have solved the problem. The motor is running off of 12V and set to about 1.4A. If anyone had any thoughts, I would appreciate it. I figured out my problem above. I'll post it here as an fyi to others in the future. I was using a 500Hz signal to my driver for stepping when I was getting problems. I upped my frequency to 1k Hz, and it works completely fine now. Would these work with https://www.sparkfun.com/products/10267? Has anyone had any luck running these with the Snootlab Rotoshield? I'm having issues with them changing direction sporadically when commanded to run forward for X steps. Is this motor bi-polar or uni-polar? Ditto - I'm sweating on these also. Anyone knows when they will be in stock again ? Has anyone run these at 24v? I'm putting these in a mendelmax and I'll have a nice beefy 24v switching supply for the heated bed, as well as a 12v switching for everything else. I'm using a sanguinololu board with 4 A4988 drivers. I'll start them off at 12v, but if anyone has run them successfully at 24 I'd like to know. I've successfully used these with a 24v power supply, driven by the a4988 pololu drivers without problems. I've had to tune the a4988's, but other than that they seem to work fine. Hi, what will possibly be the best bridge for that one ? L298 ?? any other suggestion? I just got the ARDUMOTO to work with this motor this evening. So what is correct for this motor? The datasheet on the spark fun site or the data from the manufacturers website? About 10oz/in difference between the two! I'm working on a dsPIC based step motor driver and I'm actually running one of that at more or less 180RPM with microstepping (8microsteps/step) Here is a short live demo http://www.youtube.com/watch?v=G3GAjPCV5qA Thanks! I am looking into building a small CNC Mill and I was wondering if 58 oz-in would be powerful enough. I like the resolution (400 steps/rev) on these. I would rather use these than the 125 oz-in ones if I can because of the resolution. Thanks for any help or advice. I checked the Datasheet and the website (http://www.wantmotor.com/ProductsView.asp?id=157&pid=75&sid=80) and I can't seem to find what the mounting holes are tapped for? I'm guessing an M3 or M4 but not sure on the thread pitch. Can anyone tell me so I can find the right bolts/screws. Doh! Looking at the Datasheet again I see that the holes are labeled 4-M3 and it looks like 4.5mm deep. Now I just need to know if it's 3-48 or 3-56 or is it Metric M3-.50?? All Nema 17 motors are going to use M3-.50 metric screws since it's a metric size motor with a 5mm shaft. Basically when they said 4 they meant 4 each, M3 metric screws and the only popular thread in M3 is 0.50. Valid question. 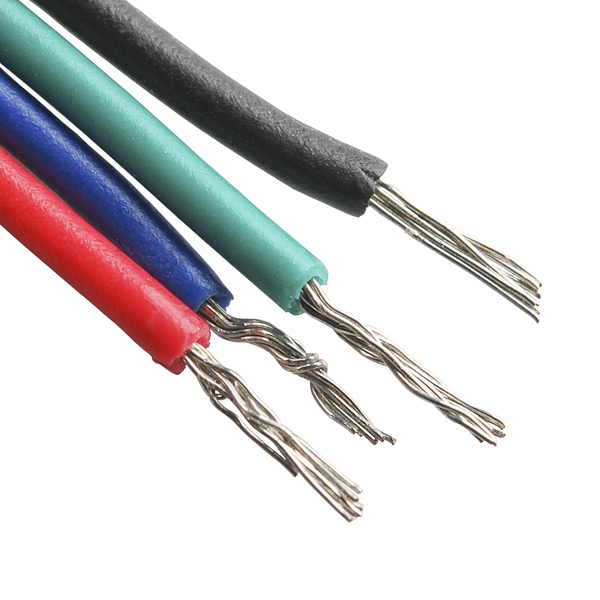 what wire gauge are the wires? Any idea when they will be back in stock? ETA is later this week. Still no stock :( tear. It was scheduled to be here, but it's a bit late. Sorry!!! It should be very very soon though. Thanks for the update :). I do love you guys. I just want you to take my money, really badly. Tracking shows them in Denver, so another day or so (plus some extra time to get them in stock). End of this week for sure unless something bad happens. Another question for the easy driver: this motor is rated for 3V while the easy driver runs from 7 to 30V is that an issue? stepper motor voltage is strange. in short, you can run a stepper at a MUCH higher voltage than rater. do a little search online about stepper motor voltage ratings and you'll see that you'll actually want to run them higher. i'd like to know this as well. Which one is correct? Does no-one read datasheets anymore? The holding torque is listed as 48 N.cm (i.e. 68 oz.in) right there on the first (and only) page of the linked datasheet. This makes no sense. The datasheet posted for the product is clearly incomplete. Meanwhile the one on the manufaturer's site appears more complete but conflicts with the specs stated here. People should continue to ask for clarification. SF help? However the website linked in the datasheet shows 4200g-cm, which comes out around the 58 oz-in rating in the title. Is the holding torque 58oz.in or 58 N.cm? Mine has resulted in the easydriver frying itself. I guess I'll order 3 big easydriver's now? Could you please recalculate the estimated holding torque for the new stepper motors listed to give out the same data as the first one you had in stock for some time. Whats The kgcm on the new ones. torque is measured a lot of different ways. use google to search for conversions. you can go between lb.ft, oz.in, kg.cm, N.m, etc. here's a good site for that. Torque units are lb-ft, oz-in, kg-cm, N-m, etc. I calculate a 1.6" face, would this be considered NEMA 17 ? yep, it's NEMA17, I added that to the description. I bought 3 for a 3D printer project. One was bad, with an internal short. Contacted Sparkfun and they sent me a replacement, and gave me a store credit. Really stand-up customer service. I will order from Sparkfun again, even though one of the motors was bad. It wasn't their fault, but they still stood behind the product. Well done. I used this motor to control a Z-Axis on a milling machine. It was hooked up to a ball screw and linear slide. I got a great feed rate and excellent positioning from it, all at a good price point. 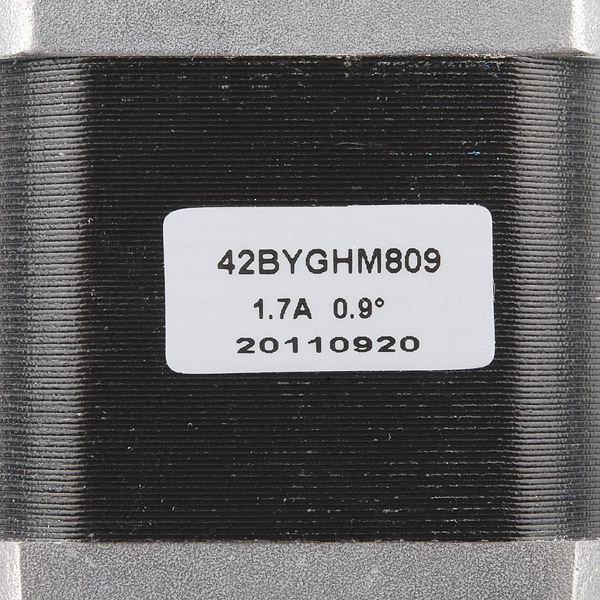 I purchased 3 of these to replace the motors that came with my SeeMeCNC Rostock Max V2 Kit. I have them connected to a Smoothieboard 5x running a Smoothieware Fork by 626Pilot https://github.com/626Pilot/Smoothieware The Shaft does not have a Flat edge (D Shape). I plan to machine a flat edge but for now they run fine without it. I run them at 1.7amps and they haven't gotten above 60C. They have greatly improved the accuracy of my printer, and I am very happy with them. I highly recommend these to someone that is looking for a higher resolution stepper for there CNC machine. These are drop in replacements for the steppers on the Robo3D x and y axes. They have half the step size (400 steps per rev instead of 200), so the upgrade allows 0.05 mm x and y precision instead of 0.1 mm. Just replace the steppers, make a minor change in the marlin firmware; change 80 (steps per 16 mm) to 160 in configuration.h. That's it. An easy big improvement in surface finish and in printing very small details! While I have not powered up the motor as of yet, The motor feels solid. I'm currently modeling mounting brackets for my step motor project. I plan on using BigEasy Driver and Parallax Propeller microcontroller for this motor drive project. Great Resolution and plenty strong enough for a lot of applications. I use them for a home made 3D printer. They're perfect, except the ends come unfinished. I had to crimp my own connectors on. The motors themselves are strong and accurate. They're perfect for the RepRap project- giving more resolution than the average stepper. 16 factor microstepping gives 6400 positions in a single revolution! If you're at a loss for what these are- they're called DuPont connectors, and requires a crimp tool. Not too hard, just tedious. I bought these to upgrade the steppers on my ZenToolworks 7X12 the 0.9 Degree step gives me greater precision and the increased holding torque means I can run the steppers at a lower current keeping them cooler. Nice stepper, good power for its size. I am on my second model of this stepper motor. The first one started to act up a bit after a year of working great. I think I broke the first motor from constantly manually forcing it to different positions. At $20 I am more than satisfied with the product and simply bought another one. I run this with the big easy driver. Started with Arduino but now operate with a NI DAQ and labview. Great torque great speed and great accuracy. 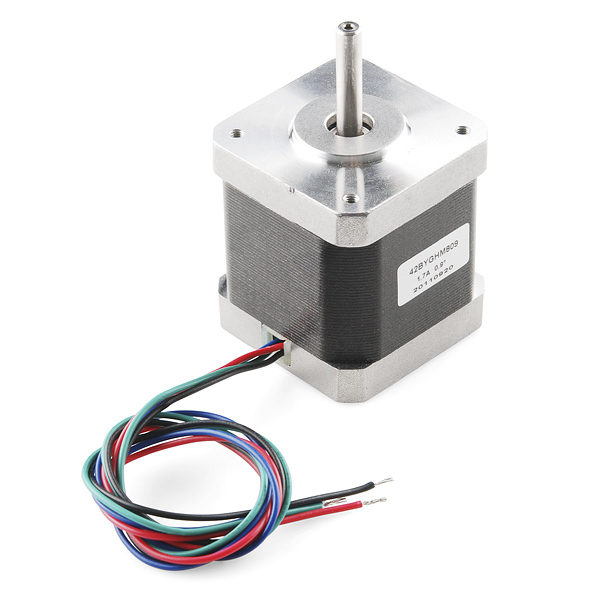 This is a great stepper motor, it has very good torque, and speed. It also has the added bonus of good accuracy. To get the best out of this motor your going to need 24VDC as it's back emf is to high to get any speed from 12VDC. I'm using it on a CoreXY 3d printer, and it generates great prints. Plenty of torque, as this is the main issue with a 0.9deg stepper. However this motor has more torque than most printers need. I will use these motors on all my printers X,Y motors. In trying to connect 2 of these motors, I found that a terminal strip I prieviously purchaced from SFE was very helpful, they look good too ( green, hee hee) . I bot a set of these to experiment with and the work great!